Being able to paint colour that creates a convincing impression of light and shadows is not easy. Especially when you’re starting out. A few years ago, it consumed more of my easel hours than anything else. And I couldn’t understand why it was so hard. I mean, the colours were right there in front of me. I could see them. Why couldn’t I just paint them? Often people will say that colour is hard to get right because of simultaneous contrast: The colours around a colour affect how we perceive it. And that is part of the story. But more than that, our perception of a colour is affected by our assumptions. If we know a colour is in shadow, we will assume it’s much darker than it actually is – because our brains are used to interpreting colour. It’s how we function in the real world, how we navigate through space and see a three dimensional world. We need to know that a yellow in shadow is still a yellow, no matter what the perceived colour is. It’s why the white patch at the back here in shadow here appears so much brighter than the corresponding one in the light at the front. In fact they’re exactly the same. But we think it’s lighter. Because we know it’s in shadow. We know that it could only appear that light if it was actually giving off light. So that’s what our brain makes us see. And squinting down to see values can help, but if you squinted at this, you’d still see the patch of white at the back as lighter. A lot of the time, we just can’t trust the assumptions our brain makes about what colour something is. 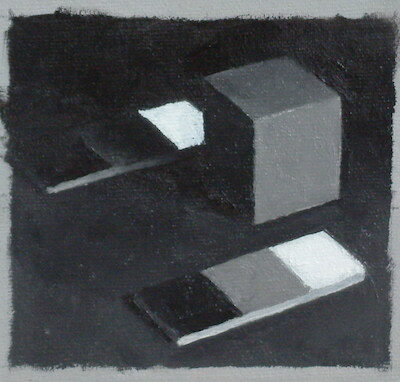 Most people think hue changes from light to shadow across forms. 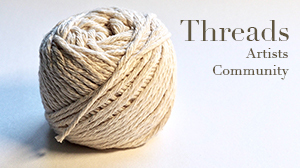 It doesn’t, much (but there is a caveat, which I’ll get to at the end of this post). Everybody knows that value changes, that’s pretty obvious. But very little attention is given to how chroma changes across a form. In fact, mostly what changes across a form from light to shadow is value and chroma, and if you can do a good job of getting both right, you will create a convincing feeling of depth, light and form – and your colour will look right. But how can we do that when we’re so bad at just judging colour accurately by eye? Well, it starts by understanding what hue, value and especially chroma really are. So how does chroma change? It follows something I call the chroma curve. Because if you plot a simple graph of how colour changes in both value and chroma, you get a curve. Firstly, here’s a pic of the set up I used for the photos I’m going to use to explain this. Left of the easel is a cube and a sphere in a shadow box. On the easel is a drawing board with a page from the Munsell Book of Colour stuck to it. 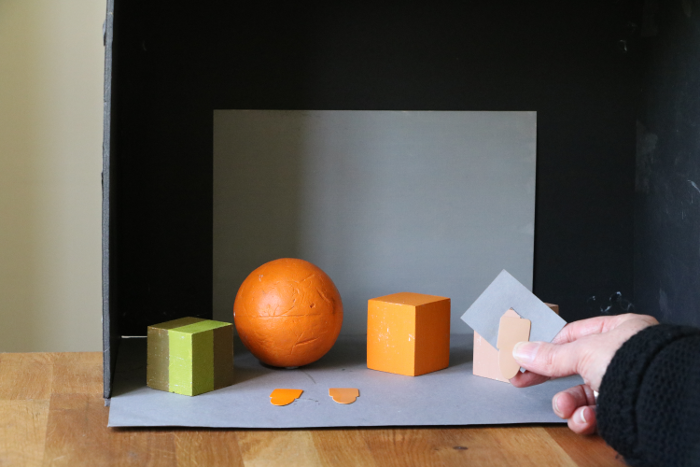 Both the cube and the sphere were painted with a single colour from that page (although, a slightly different one for each). The colour the cube and sphere are painted is called the local colour. Now, to get around the problems of simultaneous contrast and the troublesome assumptions of our brains, we need to take the colour out of its context and to see it by itself. The first thing you need to know is what the local colour of something is. 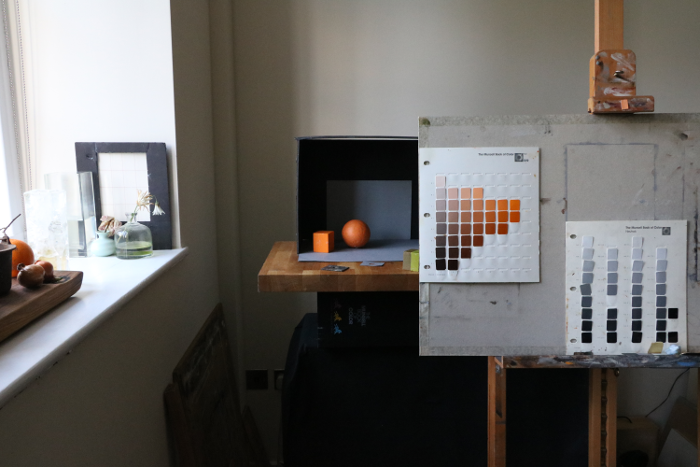 If you paint a cube or a sphere yourself, that’s easy because you chose the colour 🙂 (it’s also one reason why Munsell is SO useful for an exercise like this – you know exctly what hue, value and chroma the local colour is too). So the local colour of the cube corresponds exactly with this chip in the 5YR page from the Munsell book. So if I mix those three colours up and get them right, I can paint a good, lifelike version of this cube just with those colours (and some for the background and foreground, of course). You can also use the isolator to check your mixes, by putting a little dab of your mixed paint on a piece of card and holding up against the isolator, as I was with the Munsell chip in the earlier photo. But this is important: If you try using an isolator like this, the key is to always hold it parallel to your painting surface – at the same angle to the light. Otherwise you’ll judge the colours all wrong and it won’t work. Notice that the value and the chroma are changing, but the hue isn’t. OK, fine. But what happens when I’ve got a more complex subject than a cube? 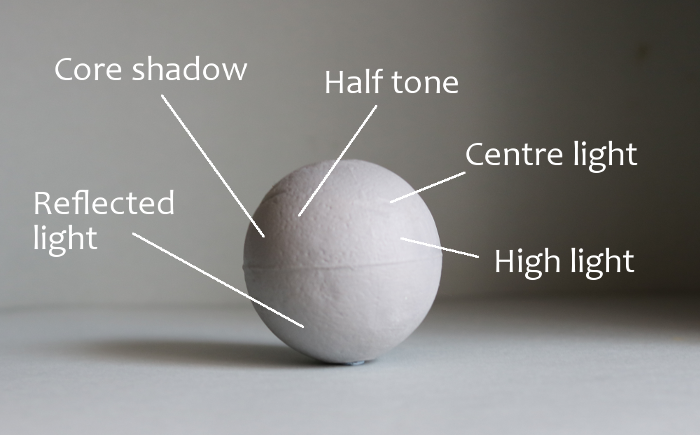 It will really help you when painting form to think about the main 5 modelling factors. You can see them fairly clearly on a regular sphere, and whilst they obviously bleed into each other and cross over, if you can find an average colour for each you can paint light and shadow pretty convincingly. Taking a rough average for the main modelling factors, and using the isolator, I can judge the colours I’ll need to paint a convincing sphere pretty accurately. I’ve only included four modelling factors. I haven’t included the reflected light here in order to keep things more clear, but usually, if I were painting a study, I’d include it. If we plot a line between those colours on the Munsell page, we get something much closer to a curve this time, because we have more points to work with. The beauty of this is that if we mix up those colours, we can find all the other colours we need by simply mixing between them, and we won’t mess up the hue. Now, assuming an object of a single local colour, this curve will always stay true. If the object has a shiny or a matt surface, the shape of the curve will change, but it will still be a curve. Can I do this without Munsell? Well, kinda. But Munsell just makes it a lot easier. In fact, I would say that the main reason Munsell is so useful is that it allows you to control hue, value and chroma independently of each other. It also allows you to see what really happens to the hue, value and the chroma as a colour goes from light to shadow in the real world. You can still learn about this without Munsell, just less effectively. Try setting up a sphere in a shadow box and use a colour isolator and a little strip of plastic or card to check your mixes. 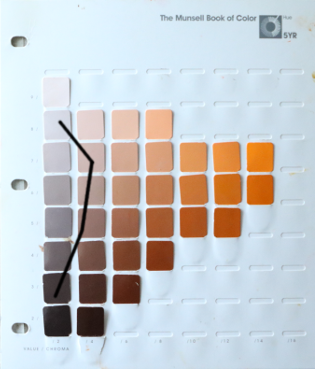 Without a Munsell reference you won’t be able to see what’s happening at the same level of detail, but it will teach you a huge amount about how colour changes across a form. Because knowledge makes you better at stuff. No really, it does. If you know how the colours you perceive change from light to dark you can start to make intelligent choices about how you use colour in your work. Also, if you paint imaginatively, knowing this will help you hugely – you’ll be able to paint convincing colour without having any kind of reference in front of you. What was that about hue? Ah yes, I almost forgot. I’ve found that hue changes very slightly as colour moves into shadow, usually in an anti-clockwise direction. 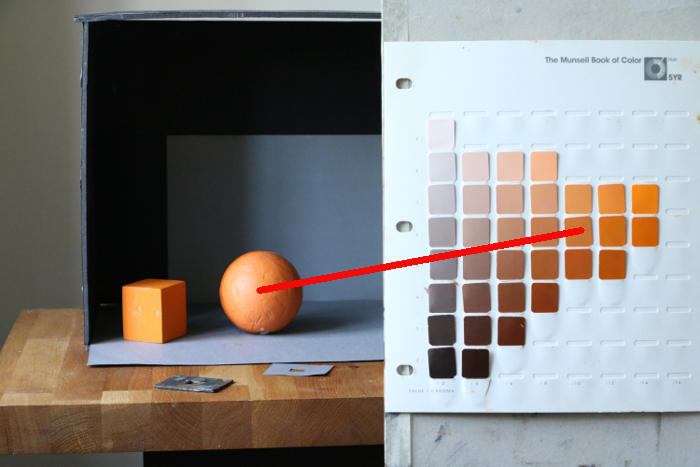 The hue of the shadow of orange objects will pull slightly towards red. For yellow objects,it will pull towards orange. For blue ones, towards green. (I haven’t tested magenta and purple yet). But it’s very, very slight. This has come from a lot empirical studies and testing. It’s what I’ve found after putting in a LOT of hours painting different forms and judging the colours of their lights and shadows, and plotting them in the Munsell book. So I’m passing it on to you. You have the entirety of my method here, so you can go and find your own answers to the questions of how to paint form. You don’t have to take my word for it. In fact, I hope you don’t, because we learn much more completely by actually doing. what colour is that shadow, really? how much darker is it than the light part? Why does that shadow I’ve just painted look wrong? how can I make this look more real? …then this method will show you the answers. Of course there’s more to painting form really well – edge handling, considering the surrounding values, value manipulation and compression, sound drawing etc etc. And if we widen the question to the making of art, we consider design, meaning, on and on. All I’m talking about here is the colour – the bit that foxes most people. If you can get this bit right, then you can move on to the more interesting stuff more quickly. On Wednesday 2nd May 2018, at 9PM UK time (4PM Eastern, 1PM Pacific) I’m giving a free webinar on all this stuff. I’m going to paint some spheres live to show you in detail how this all works. And whilst I’m at it, I’ll show why some common approaches don’t work too. There will be a live chat so you can ask questions as we go along. These things are usually lots of fun too, since you get to hang out with a bunch of other painters of all levels for a bit, albeit virtually. There will be a recording if you can’t make it live, so register anyway and send you out a link to it when it’s done. You have to take into account the colour of the light source if you’re outside, assuming sunshine. The basic method you can still use, with some changes. But what I’m talking about here relates to indoor panting in natural – or at least daylight-coloured – light. Most people who paint indoors paint this way, but of course it all changes if you have, say a more yellow light source. Learning what happens in controlled conditions like this can then be translated into other situations though, and will help you judge colour more accurately. This is excellent Paul, thank you! I have been working with learning color for quite some time now. Working with the Munsell book (wish I had the big one) and anything I can find to see color variations. Theoretically I understand the Munsell theory as I was trained as a color consultant in the 80ties through “Color me Beautiful” by Carol Jackson. 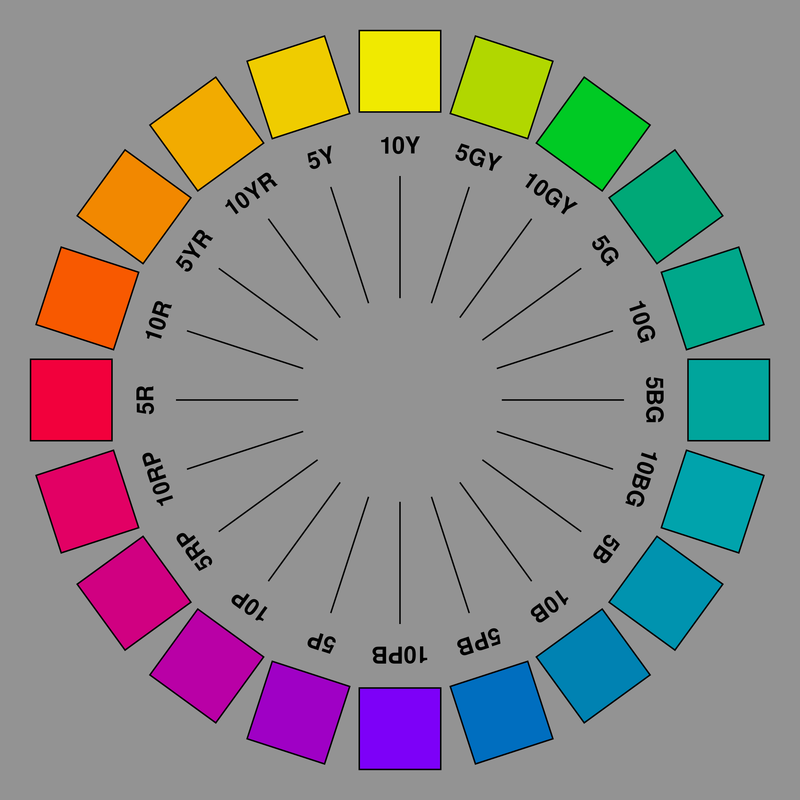 We used the Munsell theory and I learned then about Hue, Value and Chroma. This is all still in my head. Now to transfer this knowledge when I paint is another whole ball of wax. In a nutshell I just like to say that one has to practice, practice…color mixing and compare your mixed color with your subject like you demonstrate Paul. What brand of oil color one is using can be a challenge, but again to practice color identification and mixing the right combination with what you are using is most important. On a side note: we cannot judge color differences even a foot apart so the only way to see the right color you need, your mixture has to be right next to the subject. Wish you all a wonderful weekend and love to paint. Very true Helga – the only way to really judge accurately is to hold them next to each other. which munsell bbook is your large page next to your easel from, both the orange color tones page and the gray values page. They are quite large. Which book are they from? Looks like a loose leaf book, is that right? Those are from the Munsell Big book, the glossy version. Mine is an old and rather battered copy! Yes, the pages are made of card and are loose, held in a binder. Id never seen a color/grayscale value system actually tied to a painting/ photo with guide lines. That’s really good to hear, thank you! Your information is appreciated. The mixing of color exercises gives one such insight into SEEING the values. Very useful Paul thank you. I am just working my way through the Munsell sphere value exercise on the Rational Painting forum and this seems like a great way to carry on from that into colour. Your thoughts on not limiting the palette too much has greatly influenced me as I was going to set myself a challenge of only painting using the Munsell grey scale for a year, but then I thought that is one year less of using colour which will probably not be beneficial in the long run. So I plan to use value exercise as much as I can in grey but also experiment with still life in colour and use the Munsell theory and value knowledge to complement this. It’s not easy is it! No it’s not easy! My point about limiting your palette was that it’s a good idea to at least know how much you’re limiting and which parts of the colour space you can’t reach with it. OK I will give that a try! I thought it might be good to limit some things as I am almost swamped with technical learning such as the Bargue plates, Loomis / Proko figure and portrait, Munsell, Bridgman anatomy, Norling perspective. My head almost explodes with how much I have to fit in in order to progress. I have a stupid question: what is this ”bump” you’re referring to in the beginning of your e-mail ? It’s not a stupid question at all. Illustrators, especially golden age illustrators, used to talk about a band of higher chroma colour in the half tone just before the terminator df the shadow (the beginning of the shadow) I believe Andrew Loomis mentions it in his book Creative Illustration. They call that band the bump. In all my tests, experiments and studies, I’ve never once seen anything remotely resembling a band of higher chroma there. The half tone is lower chroma than the light – which when you think about it, makes sense, because there’s less light there. This is very interesting. Thanks for all your insights. In the photos in this blog, I think I see a higher chroma edge, almost a fine line, on the light side sphere against the dark shadow of the box.. are you seeing this? Perhaps it’s because of the light in the computer image. Though I’ve noticed this ‘crowding ‘ of light at the edges of things and it could be showing as chroma on the objects themselves. There also appears , in my studio,to be a lightening of value in the ‘air ‘around objects. Sorry, I don’t know quite what terms to use to describe what I’m seeing… ‘in the air’ is a little odd But perhaps you know what I’m trying to say. My god, isn’t this hard! It’s hard to see and even harder to paint. One could spend an entire life painting one tiny lemon. It really is hard! Bear in mind that here you’re looking at a photo, not direct perception, and cameras do affect things. The colours I perceive when I’m painting studies often look different to the ones in photos from my camera – and then of course the photo is processed by image software and then you see it on your screen, which will probably have a different bias from mine. We just need to be really careful when making judgements from photos – which is why I emphasise working from life so much for studies like these. I haven’t noticed a high chroma area at the edge when I’ve been painting, although there is a lower value area which will also be higher chroma than the highlight – but not the centre light, if that makes sense. I think the lighter value in the air may also be an effect of the camera, or possibly because the values we perceive are affected by the adjacent values. Hard to say for sure. I’ll look out for that next time I’m painting a sphere from life tho! Thanks Paul for this explanation. It rings true as when doing a portrait you add a band of red along the terminator edge just before it turns into the light to enhance that turn. Perhaps it is the same thing, I’ll have to research a bit more. And I’ll check out Andrew Loomis. I think you’re right, it isn’t there when you look at your subject, I think it’s something added artificially to enhance that turn and the sense of 3 D.
This was the best and most concentrated lecture I ever met during my 40 years of painting and searching for knowledge. I get very inspired. I will use it for myself and in my teaching. Yes, things get REALLY confusing when you have more than one light source – thus the shadow box, to cut down on reflected light and make the whole thing doable.